Editor’s note: Martin Fleck is Security Program Director at Physicians for Social Responsibility. PSR and its international affiliate, International Physicians for the Prevention of Nuclear War, received the Nobel Peace Prize in 1985. The views expressed are his own. The anniversary of the atomic bombing of Hiroshima this Wednesday is as good a time as any to remember the ever-present danger of nuclear weapons – and the importance of acting to prevent catastrophe. The world today is fraught with conflict, but most of us don’t pay much attention to nuclear arsenals – nine nations possess a total of more than 17,000 nuclear weapons, according to Ploughshares Fund, while 94 percent of those nuclear weapons belong to the United States and Russia. These weapons pose a profound health risk to all humans. Indeed, as a recent report from Physicians for Social Responsibility and International Physicians for the Prevention of Nuclear War outlined, even a “limited, regional” war between India and Pakistan using just 100 Hiroshima-sized bombs – less than 1 percent of the world’s arsenals – would likely result in the deaths of 20 million people outright, cause global cooling for a decade, disrupt agriculture over the entire northern hemisphere, and threaten as many as 2 billion people with starvation. "To err is human." An accident could happen at any time. In his latest book, Command and Control, Eric Schlosser documents 78 known incidents where something has gone amiss with the American nuclear weapons enterprise. This includes some well-publicized incidents such as the weapon that fell from a B-52 bomber over North Carolina, started to arm itself, and almost detonated in 1961. Who knows what hair-raising incidents have happened in other nuclear-armed states? And with the proliferation of the weapons comes the danger that terrorists will get hold of the materials to make a bomb. We are living on borrowed time. In Prague in 2009, U.S. President Barack Obama stated “clearly and with conviction America's commitment to seek the peace and security of a world without nuclear weapons.” Since then, his administration has put considerable effort into securing “loose” nuclear materials around the world. However, in other arenas, his administration has moved away, not toward, a nuclear weapons-free future. Obama’s budget for 2015, for example, ramps up spending to modernize or replace the entire inventory of strategic weapons – land-based missiles, submarines, and bombers. The Congressional Budget Office estimates this “modernization mountain” will wind up costing $355 billion over the next 10 years. If the president meant what he said in Prague, then he needs to rethink his investment strategy. Sadly, so far at least, this administration has refused to take advantage of the most promising international nuclear disarmament initiative in decades. Take the inaugural, historic Humanitarian Impact of Nuclear Weapons Conference, which was hosted by the government of Norway last March – 127 nations attended, but not the United States. Three quarters of the nations of the world—146 nations—saw fit to attend the Second Humanitarian Impact Conference in Mexico last February. The U.S. was again absent. And we have been invited, yet again, to the third conference in Vienna, to be hosted this December by the government of Austria. The United States should seize this opportunity and constructively participate in this vast international forum, which expresses the aspirations of humanity. « Previous entryWhat I'm reading: Will U.S. help the Kurds fight ISIS? US must step up. US must take the lead. US must do more. Jesus H. Christ. Why must it always be the US ? Are we the only country in the world. Is it because the other countries don't want to be cast in a bad light if things go wrong ? On many occasions, when the US is in the lead role, which is most of the time, and things have gone wrong, which they have many times, the international community are quick to condemn the US for it's actions. Let some of the rest of the world fill some of the "must do" roles for a change. We can't afford it. The Majority of the World Populations' are awake, to see practical things. The Nuclear issues, how to build it, secretly, becomes, a daily struggle for those who would like to have it. In 2008 we almost had a Sarah Palin catastrophe but we managed to dodge that bullet. But she continues to shrink her supporters' brains each time she speaks. So there still is a concern. But at least it's her supporters' self inflicted wounds. Tea party patriots brains don't just shrink, they rot. So that's why they stink. I thought it was just the crap they spew from their mouths. Probably the combination. Responsible nations are not the only potential sources of nuclear weapons. Small terrorist groups or insignificant nations can build and detonate nuclear devices. The USA would be foolish to volunteer for nuclear weakness in a world where irrational thinking could unleash nuclear attacks, Islamic Jihad by paradise-bound martyrs is only one of many possibilities. I am worried about the return of cold war. Two mishaps almost lead to a nuclear. First Cuba missile crisis and second Israel 10-days war with Arab states. Now Ukraine is building up together with economic war. It is socially irresponsible for a large nation to become weak for the purpose of appearing to be saintly, or to receive peace prizes. The colorful photograph accompanying this article has the power to elicit a strong emotional response. I also remember the mentally devastating, physically sickening effect that hearing the radio report of the attack on Pearl Harbor had on my family and me as we listened. My mother and grandfather tried to hide their weeping from me, but we all knew that my uncle was on a Navy ship somewhere in that area. 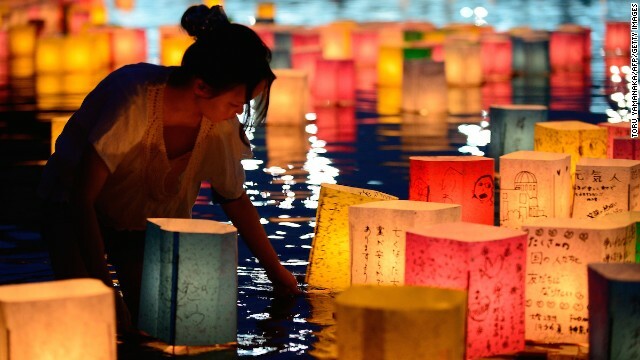 Thoughts of Hiroshima must always be accompanied by remembrances of Pearl Harbor. I remember reports of the pounding of US sailors as they tried to escape sunken ship compartments, and the eventual cessation of the pounding. We were four, My father was also there in the living room, beside the radio. Nuclear weapons must never be used. They need to be abolished all around the world. There will never be a good reason for their use. As Albert Einstein once said: "I made one great mistake in my life... when I signed the letter to President Roosevelt recommending that atom bombs be made" (this after the bombs hit Ja pan). Perhaps one the worst tragedies of the 20th century. I disagree with Einstein about when he made the mistake. Signing the letter was correct. He made a mistake inn contradicting himself later. Einstein was also mistaken in a statement he made about the existence of God, inn which the celebrated genius roughly paraphrased the Eighth Psalm. 9:00 – I don't think it's too late. The decision five years ago by the United States to open up nuclear trade with India overturned decades of U.S. and global nonproliferation policy. Critics feared that global nonproliferation norms would be undermined by the extension of nuclear trade to India, a state that has tested nuclear weapons and never signed the nuclear Nonproliferation Treaty (NPT). They also feared that the deal could have the practical result of freeing up domestic uranium that India could use for its weapons program. US should mind its own business.Let the people of other countries handle their own problems.If their is any more help needed there is the United Nations Organisation to provide that.Unfortunately UN,IMF,World bank almost everything is so much dependent on the US.It shouldnt have happend.Other countries in the world also deserve better. Non parlo inglese. Che significa, "if their is?" And the most important thing that HAS NOT been mentioned yet. Is the fact that if ANY sect of those now fighting in these so called hot spots in middle east got hold of even the crudest version of a atomic weapon. Would not hesitate to use it on others!!! Not in the SLIGHTEST.!! If hamas.. Isis.. Or the likes had something that would cause massive killings. Would have already used it! You can TOTALY bet on that fact.! Biggest reason that a nuclear war hasnt already happened is that it would push humanity back into the pre horse and cart stage in most areas. Thats EXACTLY what these radicals want!!! Force everyone back to master/slave era. With them as the masters of the glass piles..